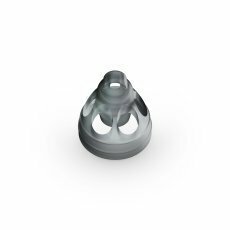 NEW 10-pack of Unitron Open Smokey Domes size Medium. These smokey colored domes are designed to avoid discoloration and wax buildup. Will fit just as well as the previous clear Medium Open domes. Please verify size and type before ordering. If you have any questions about this product by Unitron, contact us by completing and submitting the form below. If you are looking for a specif part number, please include it with your message.